Bottom Shown with 3 engraved beads. 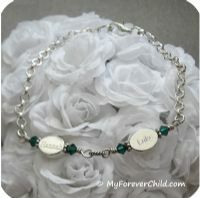 A pretty way to wear all your children's names on your wrist, living and passed. 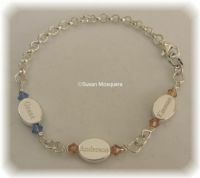 Our sterling silver oval beads can be engraved with up to 8 letters. Name is engraved on both sides. An additional charge applies if a different name or date is engraved on the reverse side. Only fill in the engraving fields for the BACK engraving if it is to be DIFFERENT from the front of the bead. Each engraved bead is flanked by the child's birthstone crystal, and hand wrapped in a sturdy sterling silver wire for extra security and a fashionable look. On a 5mm sterling silver rollo link chain. With 4 or more beads, the chain will be ommitted. With lobster claw clasp. The basic bracelet price includes ONE silver engravable bead. Choose the bracelet length in the drop down box below.